DESCRIPTION: This 80-hour course is for individuals or teams, who are full-time, sworn law enforcement officers only. This course involves demanding tactical training and rigorous physical activity. The course will focus on contemporary tactical procedures and weapons skills that will prepare the officer to function as a team member. Also covered will be team organization, operations and movement involving dynamic and deliberate clearing procedures, basic rappelling and live fire mission executions. LEAD INSTRUCTORS: Deputy Jeff Reed has served as a Firearms Instructor for over twenty years. He is a certified NRA handgun, shotgun, rifle, submachine gun, and long-range rifle instructor. In addition to serving as the Basic Academy Range Coordinator he is also responsible for tactical firearms training, firearms instructor training, and other Regional Training Center range programs. Deputy Reed has received extensive firearms training from some of the nations most recognized instructors and has competed at national shooting competitions. Members of the Alameda County Sheriff's Office, Special Response Unit (SRU) will also be instructing various blocks of the course. PREREQUISITES: Students must be full-time peace officers approved for SWAT training by their agency, and in excellent Physical condition. Students will be tested to ensure minimum physical strength and ability. All students who are not members of the Alameda County Sheriffs Office, must sign a liability waiver. PRESENTATION HOURS: This course starts at 0800 on the first day. Students will be provided with a course schedule on day one of the class. There will be three night sessions during this course. REQUIRED EQUIPMENT: Clothing suitable for physical ability test, Lace-up over the ankle type boots, body armor / load bearing vest, helmet, flashlight, gas mask, handcuffs & key, tactical mirror, SWAT uniform and other individual team member equipment as supplied by the respective agency. CERTIFICATION: POST Plan II. POST Cert #1010-23000. DIVERSIONARY DEVICES: Each participant must have five (5) diversionary devices. SAFETY ITEMS: Each student must have rappelling harness, locking carabineer, rappelling gloves, Figure 8 belay device, Nomex gloves, ear and eye protection (goggles and/or shooting glasses), personal protective body armor, Nomex hood, and helmet. 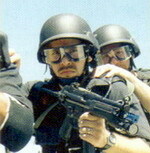 ADDITIONAL CERTIFICATION: Each participant must complete the FBI SWAT Physical Fitness Test the first day, in addition to passing the tactical skill evaluations. The FBI SWAT Fitness Test includes: Pursuit / Rescue Climb, Assault Dash, Tactical Obstacle Course. RESERVATIONS: Use the link below to submit reservations on-line. If you have any questions regarding registration for this course, please contact Melisa Tolero at (925) 551-6970.